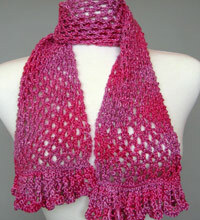 Requires: 2 skeins of regal silk alone, or 1 skein each of silk and ribbon for a great textural contrast. finished size approx. 5.5"x50"